There have been a fair amount of discussion on post-work of Daz Studio or Poser renders. Indeed, one big complication of post-work is that it can encompass a wide range of techniques. Some people go all the way, and paint over the entire render; only using the rendered image as reference. Others, may use filters and actions; while some only resize and add a signature. As a result, it is not always clear which part of the finished image comes from the Daz Studio/Poser render and which part comes from the post image manipulation. I have gotten some questions about this as well, so I thought it would be fun to show how my images develop from pre to post to done. Combining all light layers (except for volumatric light). Add filters, actions, effects, and volumetric light. Add detail using Color Efex Pro 4 from the Nik Collection. I do very limited paint-overs, mainly to fix collisions and poke-through. Most of my post-work involves using layer blends, filters, adjustments, and actions. For a detailed description of my post-work process, please refer to my Step-by-Step Daz Studio Post-Work Tutorial. I will be using the Fantasy Red Head Warrior Woman image above, to show my pre and post-work progression. I used Legacie Hair, Kadis armor combined with Daemon outfit, and Terradome 3 to create the scene. Larger version in my Daz Gallery. Left – Pre image with only an Environment light. Right – Completed image with all lights and post-work process. Based on what we see above, it seems that there is a very great difference between the pre and post-work pictures. However, the left image is only lighted by an Environment Map, whereas the right image has Environment Map, key, fill, two rim lights, a top light, a volumetric light, and outfit lights. Therefore, it is not a very fair comparison. I combine light layers in Photoshop because it is much faster to experiment with different light intensities and colors. In general, if I can do something better in the scene render, then I do it in the scene render. If I can do it better in post, then I do it in post. Ultimately, it doesn’t matter which is done where, as long as I can get an end result that I am happy with. This article has more on how I combine lights in Photoshop. Below is the image with all light layers combined except for volumetric and outfit lights, which we add in Step 2. This is perhaps a better comparison because it contains close to comparable lights as the finished image. All light layers combined except for volumetric light and outfit lights. This is the largest step as we add all our filters, adjustments, and actions, as well as the volumetric and outfit lights. Some operations include adding glow, sharpening, softening, tone readjustments, adding effects, and more. After doing all this, the image is very close to the completed picture. Red head warrior woman image after adding Photoshop adjustments, filters, actions, and effects. In the final phase, I bring out more details using Color Efex Pro 4 from the Nik Collection. You can get the Nik Collection for free from Google. It has many useful actions for manipulating photos and images, so definitely worth a look. I also do more light and contrast adjustments as necessary. To Post-Work or Not to Post-Work? There have been some interesting discussions about this in the Daz forums and elsewhere. I am a fan of using whatever tool that will help me create the best end-result. Before I started with Poser and Daz Studio, I did digital painting. It was a lot of fun, even though I was not very good at it. Later, I started playing with Photoshop in a limited way, to add fantasy backgrounds to photographs. Next, I tried out Poser, Carrara, then Daz Studio, which allowed me to create much better images. Now I mostly use Daz Studio, various DS plugins, Photoshop, and various PS plugins. I am not a trained artist, so I am very excited when there are tools like Daz Studio and Photoshop that help me create images that I previously could not make. Below are two more pre and post-work images. The left images only use an Environment Map, because I combine light layers in post. Pre and Post-Work Images for Red Head Woman in High Boots Pin-Up Art. Pre and Post-Work images of a White Haired Girl and Her Wolf (Fantasy Art). Let me know if there are particular images you would like to see pre-post images for, and I will try to post more of these progression image articles. A step-by-step postwork tutorial on my Asian Girl with Pearls image. Scene was created in Daz Studio and initial light layers were rendered in Daz Studio Iray. 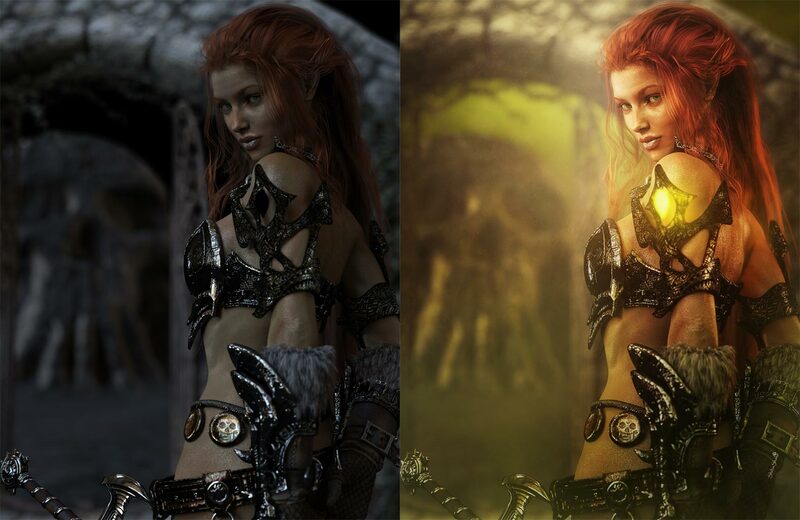 Some simple steps on how I add glow to my Daz Studio images using Photoshop. 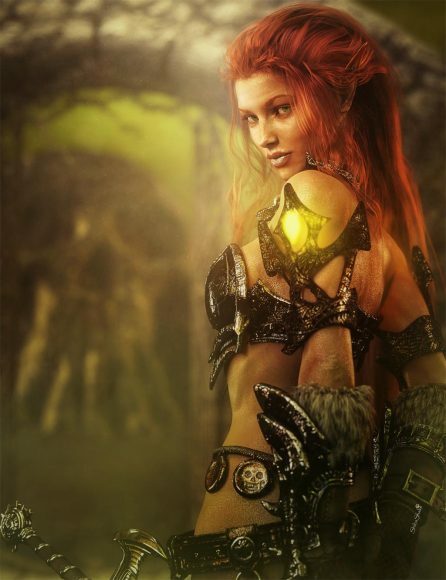 Come see how I combine my various Daz Studio light layers in Photoshop, how I add color to lights, and how I modify light layers using Photoshop masks. Just glanced at your recent post. Sure brought back memories. I was about to voice the same thing Ferret and Erwin did. I, too, miss your presence on Patreon. But I totally agree with you in that our loved ones must come first. I’ve learned a lot from you and miss you on Patreon too, but totally understand your choice and how sometimes you need to choose what you want to spend your time on. You know there’s only so many hours a day to do stuff in. Awwwwwwe….. I just love your work. Looks like you’ve been slowly tweaking your postwork as time has gone by.